The major European markets showed strong moves to the upside yesterday with the UK's FTSE 100 Index advancing by 1.2% to close at 7062 after the US and China agreed to a temporary trade truce Saturday night. There is some confusion on how Sino-American trade negotiations will progress, however, and this is adding to the volatility and the uncertainty of whether this trade relief rally will continue or not. The Footsie's close at 7062 marks the highest recorded closing price since November 9th. 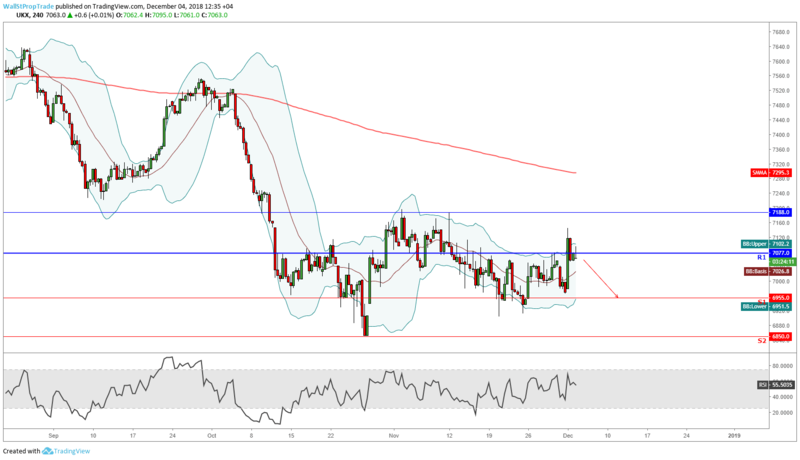 Closing above Friday's high at 7042, the market confirmed its breakout through the previous session high after trading up to £103.39 above it intraday. The index also managed to cross the 20-Day moving average which sets a positive note for today's session. However, failing to cross above the key resistance level at 7080 marks the importance of that level going forward as it will now likely become the optimal exit for swing trading on the long side.